I’ve been thinking about how thin the veneer is between us and the wild, how porous the borders, how I simultaneously crave the peace and calm of a contained and civilized existence, even while sensing my need to be out in the wild. I’ve been thinking about how much of my life involves containment, grooming, and cleaning — there is so much effort involved in keeping our domestic environment, and ourselves, free from dirt and bugs, safe from weather, our food at a remove from the earth, our bodies in a socially acceptable state. Sometimes it seems like nothing more than illusion. 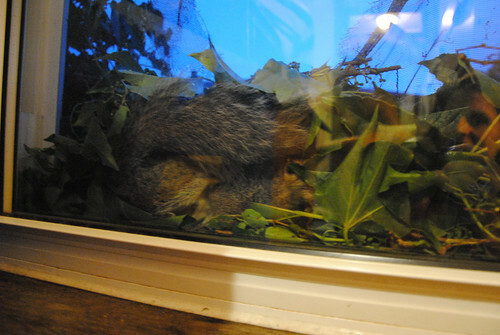 Recently, a squirrel tore a giant and strategic hole in the screen outside the younger kids’ room. It then dragged in a bunch of ivy, and set up house. Clearly, it was pregnant, and nesting, and had no intention of leaving. 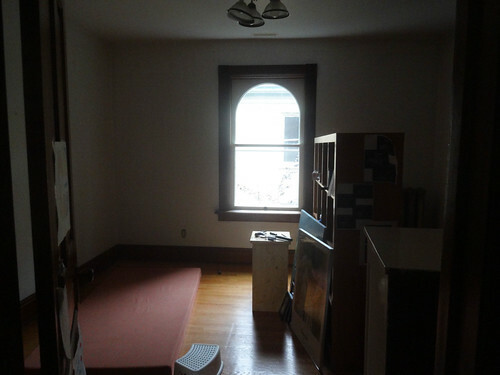 Briefly, I considered letting it stay, since the window would have provided a terrarium-like observational environment for homeschool-style education, but then I thought of everything that could go wrong. (Infant rodents perched two stories above a paved driveway, smushed up against the kids’ bedroom window???) So instead, we scared off the squirrel, and removed her ingenious screen nest. Happy Birthday, DJ and Suzi! Our dogs seem like the least wild of creatures, but it fascinates me that so many of us humans choose to live with other species. It’s been a year, as of August 6th, since we’ve shared our home with these two little doggie-wogs, aka the poggles, aka the pogs, as they’re called, among many other odd nicknames (where do nicknames come from?!). 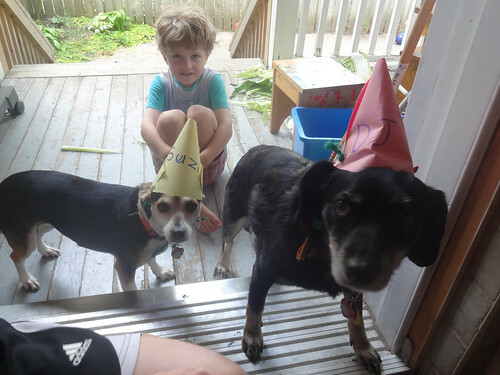 All of the kids made them birthday cards and fashioned these little hats for them, too, though the dogs were tolerant of (ie. not keen on) the hats, and only “listened” to the cards being read to them because the card-readers were offering treats in return. I’m pretty sure we’ll always have animals — I can’t imagine life without them, somehow. I’m not at peace with the torment of bugs, or the inevitable march of dust upon every surface, or the grease in the stove’s mesh trap, or the relentlessness of change and accumulation that demands vigilance and attention. I’m not at peace with it, because part of me wants to live with less and less and less stuff. The less stuff we have, the less there is to protect from the insinuation of the wild. I’m not at peace with it, also, because I can’t really prevent these invasions from happening. I have other things to do. There will be dust on the bookshelves, and dog hair under the couch. Not all the time, but it’s coming back, no matter how much effort I expend on keeping it at bay. Which is maybe my way of saying that I’m not at peace with it, but I accept it. I keep it out, and I let it in, in balance, as much as is possible, all the while understanding that I’m part of it, too. It’s not separate from me — the wild. This post reminded me of Robinson’s Housekeeping, a book I avoided reading for a long time because I thought it was about keeping house and that it was going to be difficult/”good for me”. I’m so glad I finally read it and then kicked myself for not reading it before, though I probably read it at the perfect moment in my life–during those marathon nursing early days of Harriet. I’m sorry to hear you have bed bugs. They are a huge problem in Vancouver and can be very difficult to get rid of. I hope they leave you soon. Loved that book, too. I should re-read it. Will we rid ourselves of bed bugs with one treatment, I don’t know…? I can only hope hope hope. I hope so too! Getting rid of your bed will be a huge help. I’m late to the party… Sorry to hear about the bedbugs! I hope the new bed and steam took care of things! I’m waiting to get a new bed. I don’t care if we sleep on the floor for months, I want to make sure the bugs are gone before we settle back in again. Touch wood, so far so good. At least there is one less invasion upon your life (silver linings and such): dirty diapers! ugh, we had bedbugs and the process to get rid of them was HORRIBLE and we were painfully embarrassed about it. 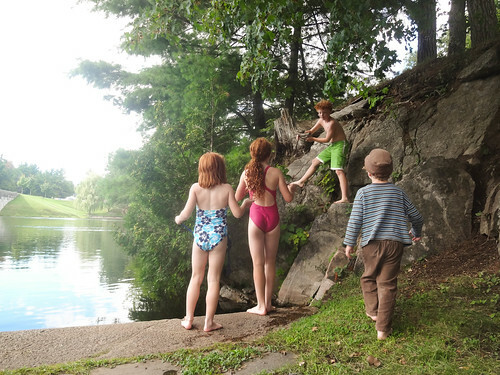 Whenever my kids get bites now (which happens because it’s summer and their blood is sweet), I do a mini freak-out and hope that it’s just a spider. sighhhhh You seem so calm about it. It is horrible, and I wasn’t sure I could cope after spending that first day of discovery basically putting our entire house through the drier — still working at 1am, I thought I might not have the strength for the task. It helped to have my husband do the bulk of the research as we decided what to do. So I woke up the next morning and got on with it. Our life is so full of bumps and sudden turns, I almost don’t expect it to run smoothly — so maybe that makes it easier to stay calm, generally. But as far as embarrassment, well, I’ll admit my initial response was embarrassment, but I nipped that emotion in the bud. We’ve had lice before too. These things happen, no one is at fault, and the more we talk about them, the less others will feel embarrassed! Ugh. Dreaded bedbugs. Respecter of no person. My best friend’s son caught them in a hotel last year while she was undergoing cancer treatment — it felt like an outrage to have that on top of cancer. Fortunately and unusually, they did not even spread to anyone els. Margo, I get the freak out part but you need to be embarrassed. They are frighteningly widespread. I try to remember to check before I get into any hotel bed, but usually remember just as I’m snuggling down for the night.